Chatting to Brian Danclair from Fish Wings and Tings recently about food in Trinidad over Christmas brought up the mention of pastelles and everyone in the restaurant at the time immediately enthused about them and suggested he make some this year. As I left and walked Las Americas butchers on 1st Avenue in Brixton Village, I saw some banana leaves to buy and decided that I would definitely be making pastelles myself this Christmas. The Trini name for a Caribbean and South American staple, pastelles are a parcel of cornmeal stuffed with minced meat, fish or lentils before being wrapped in a banana leaf and steamed. Pastelles in Trinidad vary from neighbouring countries’ versions in that the filling always contains capers, raisins and olives. They are an essential Christmas dish on the island and families often have parties based around making them to share the stages of making them. However as they freeze well, you can make a big batch and have them throughout the year! Don’t be scared by the length of the recipe, they aren’t difficult to make, they just take a little time. Before you start you will also need fresh or frozen banana leaves which are sometimes known as fig leaves. You can get these currently at Las Americas or often in the Wing Tai Chinese supermarket on Electric Avenue. Allow the frozen ones to defrost and wipe them clean with a cloth before cutting into twelve 20cm pieces and setting aside. I usually do a few spares and also cut the same number of lengths of string too. Turn your attention to your filling. This is is cooked through before you stuff the cornmeal. Start by browning the beef or chicken in a hot pan. 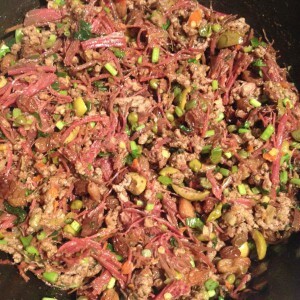 Stir the beef well to break up any chunks. I prefer to use mice with a bit of fat in it here for extra flavour. When the meat is sealed and browned, tip it into a dish and set aside. I actually used half beef mince and half the leftover spiced beef from this recipe. Add a little oil to the same pan and add the onion and sweat it for five minutes. Then add the chopped scallion, garlic, thyme and Scotch bonnet pepper and continue to cook it for another five minutes. If you are using the lentils for a vegetarian version, add them now along with about 250ml of water and allow them to start absorbing the liquid. After five minutes, add the meat back into the pan along with the tomato puree and Worcestershire sauce. Season well with salt and pepper and add in the raisins, capers and olives. Add a splash of water to loosen it all (or another 150ml or so if using the lentils) and simmer it on a low heat for about 15 minutes until it is cooked through. Take it off the heat and allow to cool. Stir in the annatto oil at this stage. Also known as roucou, annatto adds a slightly spiced flavour and rich colour to the filling. Pour the cornmeal into a large bowl and add the salt and the oil. Pour about two thirds of the water into it. In order to get the cornmeal to swell up and be soft enough to fold, the water should be hot enough to make you want to pull your finger out of it again immediately. Don’t use boiling water. Mix the water into the cornmeal until it becomes a soft dough. If it seems dry or crumbly, add the remaining water and bring it all together into a pliable ball. It shouldn’t be sticky but smooth and easy to mould. Divide into twelve balls and place on a large plate. Cover them with clingfilm and lay a wet teatowel over this to stop them drying out and make sure they retain some heat as this makes them easier to work with. Now lay your banana leaf out on the work surface and brush it with it a little oil. If you are using fresh leaves, you need to pass them over a gas flame to soften them first. Place a ball of cornmeal in the centre and using your fingers, press it out into a circle about 2cm thick. Put about a tablespoon of filling in the middle and then lift the side of the leaf closest to you and flip it into the centre of the pastelle, using it to lift the flattened cornmeal without touching it. Repeat this with each side of the cornmeal until you have a sealed corn parcel with as few gaps as possible. 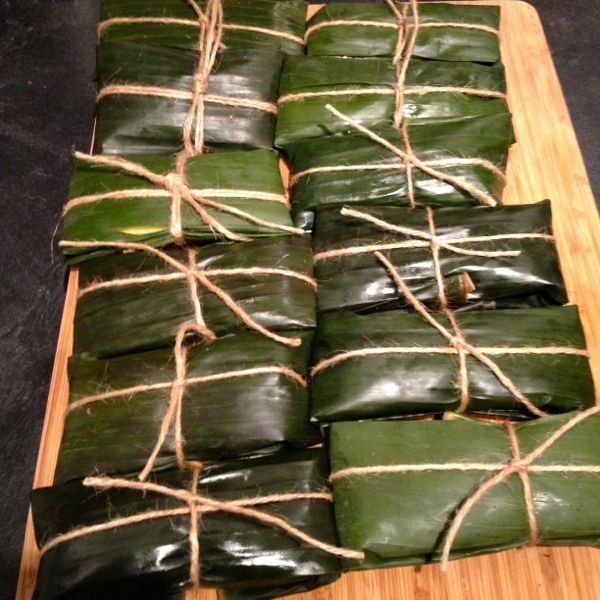 Seal the pastelle by folding the side of the banana leaf closest to you over the top as it you were wrapping a parcel. Flip the leaf over on itself tightly until the cornmeal can’t be seen. Try to get it nice and tight. Then fold the sides into the centre to wrap it completely. Set it on top of the string and cross it over to tie it tightly in a four. Set the pastelle aside and repeat with each remaining eleven balls of cornmeal. I poured a stiff drink and listened to some music, you might want to fill the kitchen with people who each take a stage of the wiping, rolling, wrapping and tying. Make more cornmeal if you have leftover filling you want to use. When your pastelles are completed, either steam or boil them for 20-25 minutes. Drain and serve warm with pepper sauce on the side. You can also cool them and freeze them until needed. Simply reheat them in boiling water when needed. These are popular finger food at parties and the lentil version is both vegan and gluten free so can be enjoyed by anyone! PS: thank you for the support on the Brixton Blog crowdfunder. Thanks to you it reached its target and we can continue to serve the local community. We make Puerto Rican pasteles just a little different but always using the banana leads in the middle of paper made for pasteles. 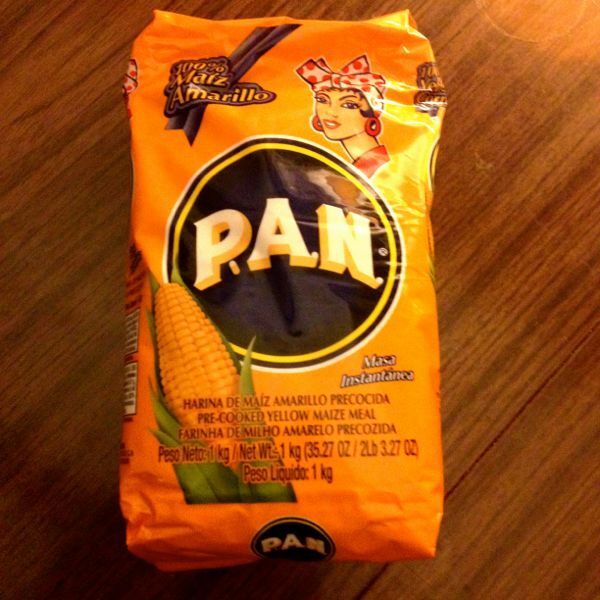 We are lucking as we have Latin supermarket in Tampa and we can locate the ingredients for pasteles. I will b e trying this version as we do not use cornmeal or mass. You keep saying corn MEAL. It’s corn FLOUR. Corn meal will break up and not form as well and is grainy . Flour is finer and holds the mold.